Fabulous job Hetty! I really like how you added the wings to the card and lifted them up! Great capture of shimmer there too! Hetty I LOVE what you did with the inks on the background - very cool!!! This is so beautifully done, Hetty! I love that background and all of the pretty colors in it. Excellent card! So many fabulous and unique elements in your card creation - awesome! What a fun card........you really do know how to utilize stamps, techniques and colors.......thanks for the inspiration. Love that fab background! This blog hop was a lot of fun - so much to see and lots and lots of inspiration! Wonderful card- I love the background- and mixing stamps with digital images- outstanding card! Love the way you did the layering! Great card!!! Thank you for sharing!! This is awesome! I have a shirt that is very much like your background....its my favorite shirt so of course I love this piece. Great job! The background is gorgeous! Love the colours you chose. 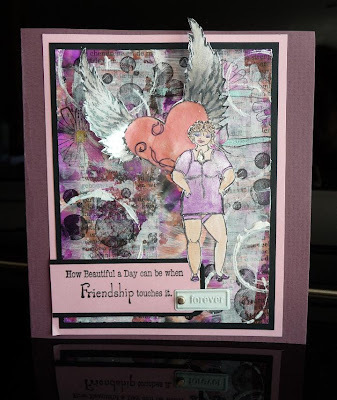 Hey, Hetty, love that alcohol ink background and just the whole combination of everything on your card! Thanks! Fabulous background on this card!